EXPERIENCE CAPOEIRA ANGOLA IN SOUTH LONDON. Austin (Emery) has done a great Flyer. Austin is a sculptor who also does wonderful paintings, artwork and other things. He has also done some great public art activites for adults and children. Very much devoted to Capoeira Angola. He was a student of Joao Pequeno's in Salvador and is always ready to devote his time, skill and creativity to Capoeira. 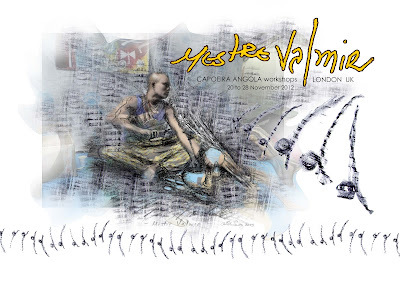 These pages are about Capoeira Angola in South London. We have classes Wednesdays from 7.30-9.00pm at Moorlands Community Centre in Brixton. We will use these pages to share our experiences and activities relating to Capoeira Angola. Our group is a welcoming, down earth group led by very experienced teachers with many years of experience of Capoeira Angola in Brazil. Both Beginners and those who have done capoeira before are welcome. Join our blossoming group learning to play Capoeira. While learning to keep your wits about you you will learn movement, music, rhythm and new ways of looking at the world. Capoeira is one of the defining arts of African Brazil expressing the essence of resistance to oppression, dedication to beauty and skill and collective play. Enslaved African's provided the base on which Capoeira Angola developed into a mature art form with complex music, lyrical, ritual and physical self-expression.